Central Piedmont Community College (CPCC) and members of the Allen Tate family and real estate company held a dedication ceremony today for the new Allen Tate Tower on the college’s Central Campus. 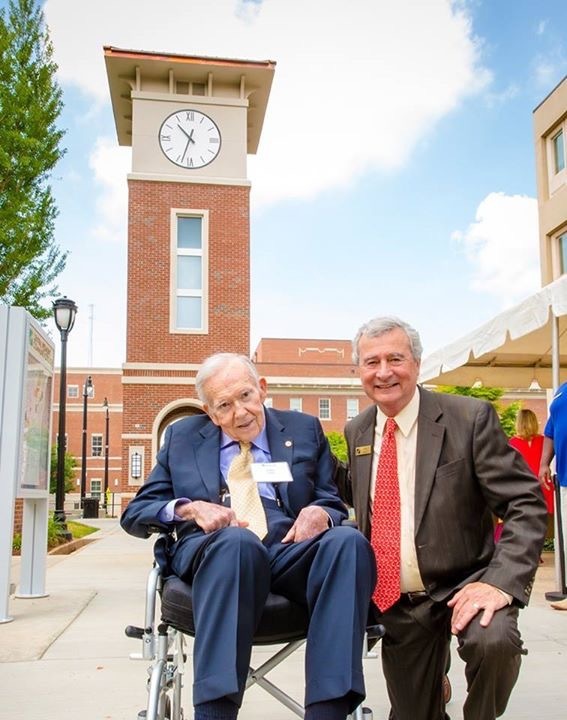 The clock tower is a gift to the college from H. Allen Tate, Jr., Allen Tate Company founder and CEO. The tower, which stands approximately 48 feet tall with a base of about 144 square feet, is constructed of brick and cast stone and features a four-sided clock face approximately six feet in diameter. The tower’s digital carillon will play a wide variety of peals, tolls and familiar songs. Little Diversified Architectural Consulting provided the design work on the project. A team from Rodgers Builders constructed the tower in six months. “We are extremely grateful to Allen Tate and his continued support of the college,” said Dr. Tony Zeiss, president of CPCC. “Because of his generosity, CPCC is now home to a signature landmark that will not only serve as a point of pride for our alumni, but also as a symbol of achievement to our current students who are working hard to be a success.